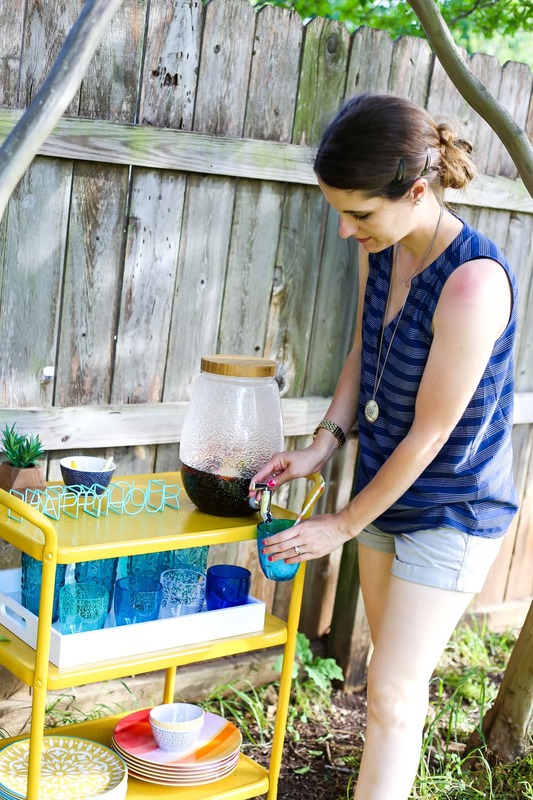 This post is sponsored by one of our very favorite brands, Rust-Oleum. As usual, all opinions and gushing are 100% me. Click here to read my full disclosure policy. Thanks for supporting the brands that support Love & Renovations! Today, I’m going to perform a magic trick. Seriously. I do magic now. What’s my trick, you ask? I’m sure you’ll be thrilled to know I’m not one of those stingy magicians who won’t share my secrets. I love to share my secrets with you. And today’s secret? You see, Rust-Oleum is kind of known for stopping rust. 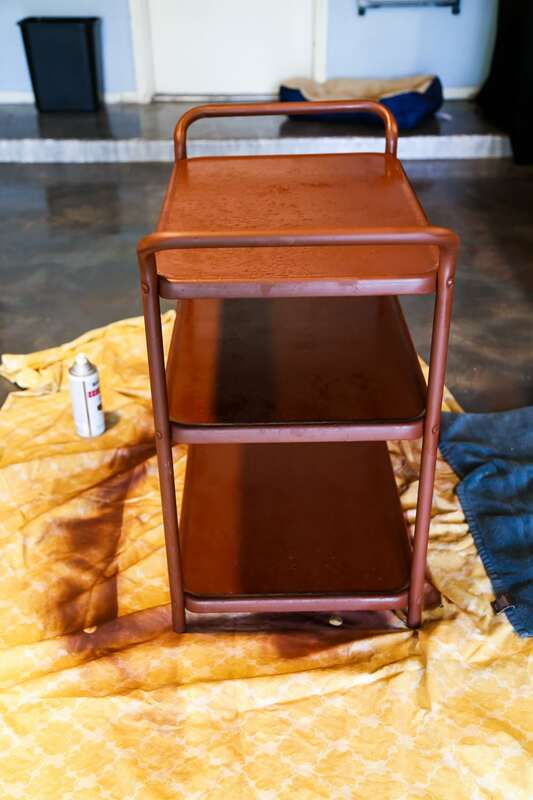 It’s what they do and it’s what they’ve always done – their very first product ever was a Rusty Metal Primer. The very same stuff I used for this project. 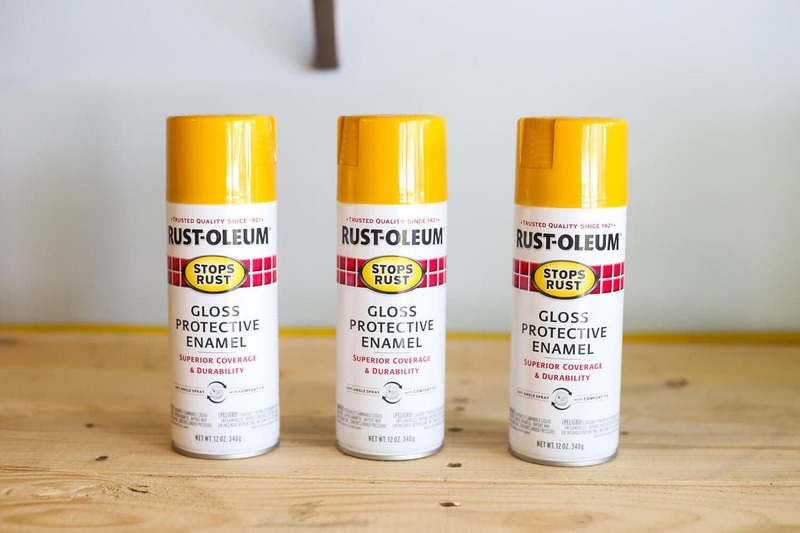 Now, they have an entire line of amazing products meant to stop rust in its tracks, and I think we all know by now that they’re my absolute favorite brand for spray paint, primer, and just about everything else. So, when they reached out and asked if I’d be interested in giving a makeover to a rusty old piece of furniture, I jumped on board fast enough to make your head spin. And goodness, am I ever glad I did. When Rust-Oleum first asked me to participate in this, I didn’t really have anything that fit the bill. So, twist my arm, I had to hit up my local flea market to see if I could find something appropriately rusty and in need of love. I looked for something with extra rust because I figured if I was going to try this rust-stopping primer out, I’d make sure it really works. So, I found the rustiest thing I could find. To be honest, I was a little worried I was stretching the abilities of this stuff. It even had a spot where there was a hole in it due to the rust. 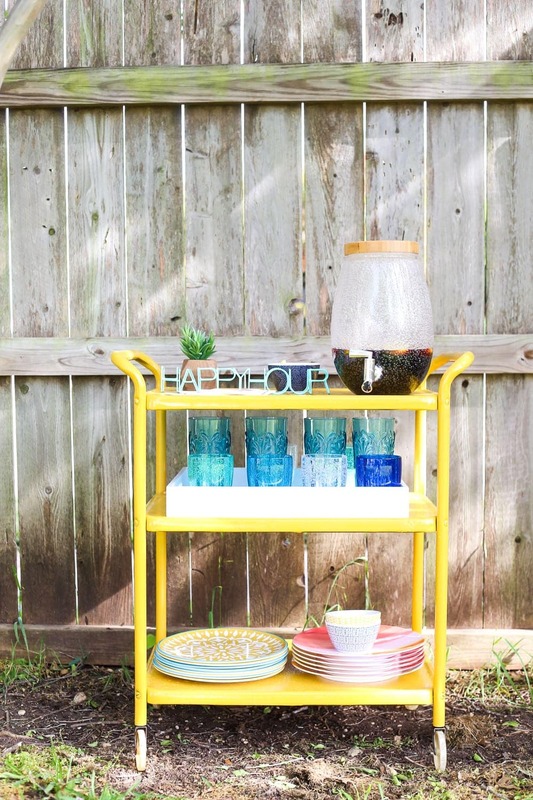 But, the bar cart was exactly what I wanted and will be perfect for our backyard makeover, so I didn’t let that stop me. I enlisted my dad to help fix it up, and a couple of days later it was looking as good as new. Seriously, y’all. There was a straight up hole there before. He’s a miracle-worker. Anyways. Once the hole was all patched up, my first step was to sand the cart down a bit. The directions on the primer state that you just need to get rid of any loose rust or paint and clean it with soap and water, so I just used a sanding block to lightly get up any areas where there were loose bits and then I cleaned it up as much as I could. I was feeling a little worried at this point and thinking maybe I was in over my head with this one, but I forged ahead. First up? Primer! The fact that the can says “use on heavily rusted metal” made me feel slightly better. But I feel like “heavily rusted” might be an understatement for what I was working with. After two coats of primer (I like to be thorough! ), it was looking better already. Next up was the paint. I chose Primer because, hi, I’m Amanda and I paint all the things yellow. It only took two coats of yellow to cover up all of the primer (I love how well Rust-Oleum’s spray paint works!). 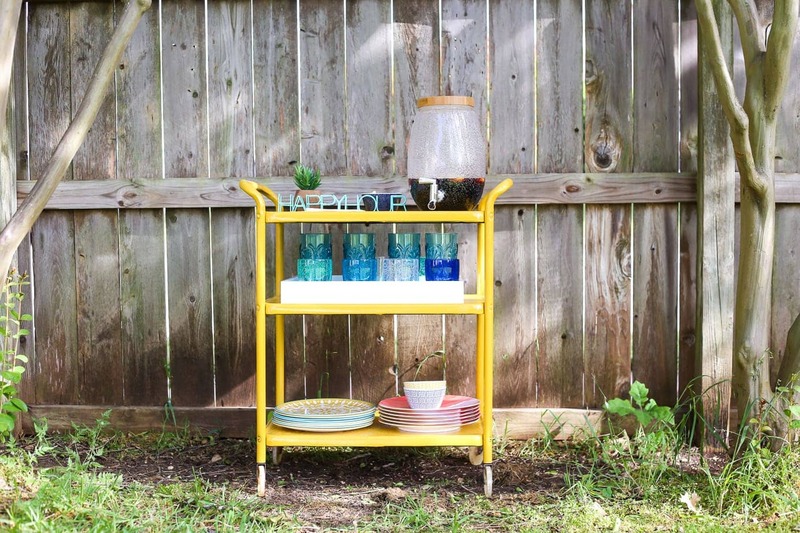 If you haven’t ever used spray paint before, it’s super easy. Just work slowly and steadily, about a foot away from whatever you’re painting. Slowly move the paint in a back-and-forth motion, going slightly off the edge each time (so you don’t have any paint pooling up on the edges of your piece). Overlap your lines slightly to ensure an even coverage, and don’t over-do it – it’s better to do multiple thin coats than one thick one. I gave the whole thing a couple of days to thoroughly dry and then I got it all set up. We don’t actually have our outdoor eating area set up yet (soon! ), so we’re just pretending at this point. 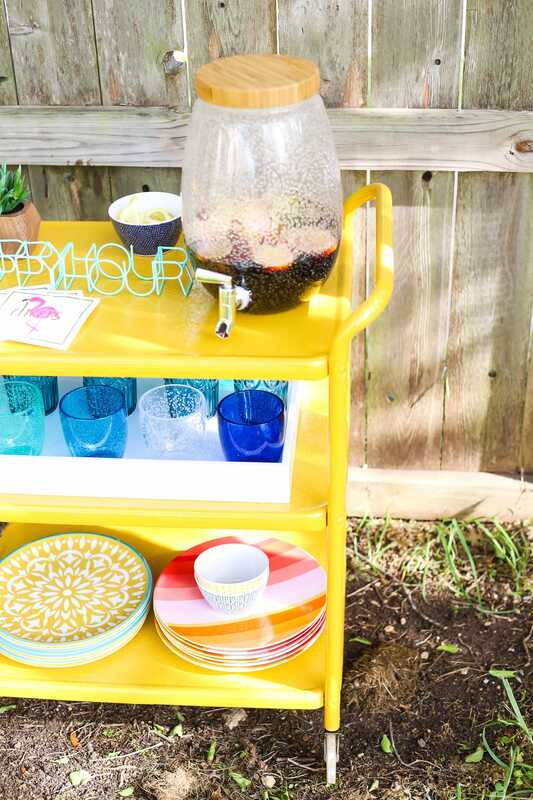 But just because I don’t have a table doesn’t mean I can’t drink some sangria in the backyard, right? I am seriously shocked at the transformation here. I’ve painted a lot of furniture in my day but this might be one of the most dramatic before-and-afters I’ve seen. 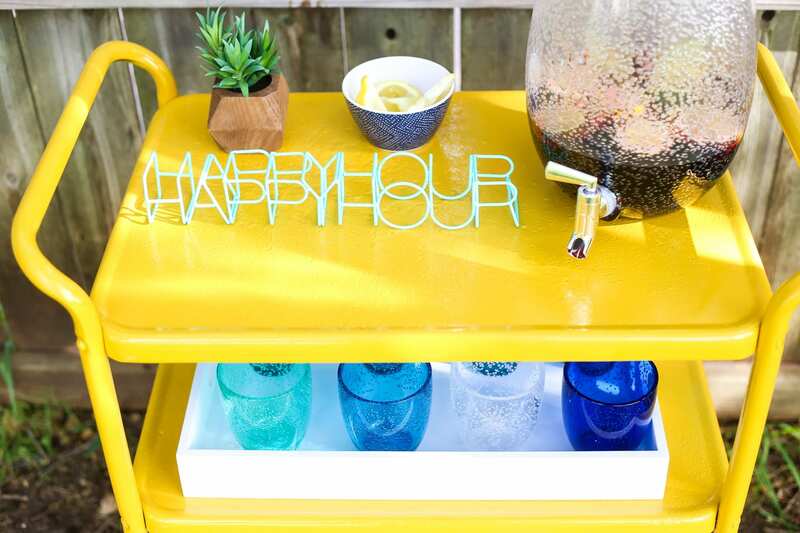 I mean, my friends were seriously side-eyeing me when I showed them photos of the bar cart before I painted it. No one is second-guessing my sanity and I will never again doubt Rust-Oleum’s ability to blow my mind with their awesomeness. This stuff is amazing, y’all. I’m really pumped to use this primer and paint again soon on another little project – my dad has this adorable old metal children’s rocking chair that was at my grandparent’s house, and it’s completely rusty and in really sad shape. But I have a feeling it’s going to look amazing once I give it some love. 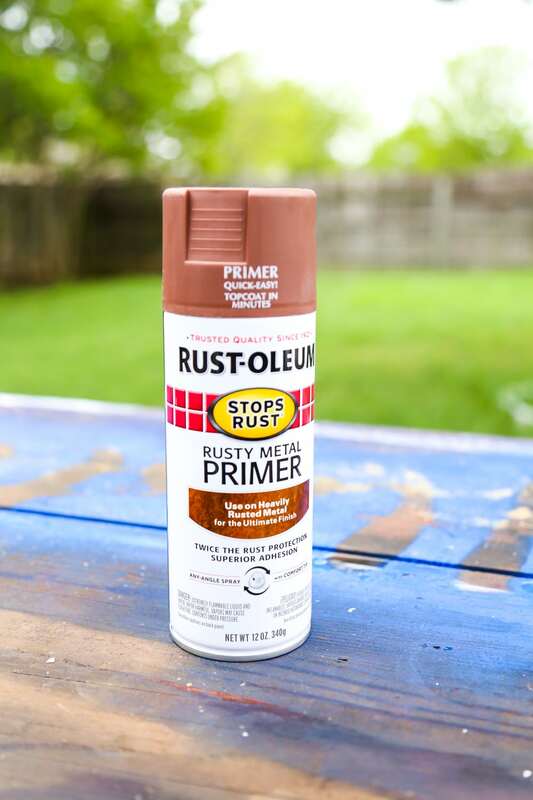 Don’t forget to go check out Rust-Oleum’s amazing rust-stopping products and give them a shot the next time you’ve got some furniture that needs a little love. Anyone wanna come over for a drink?! The best part of this cute makeover? Your terrific personality. Thanks for making it worth the read and showing us the finished product. I’m excited to see what else is on your blog. It turned out beautifully! I love the yellow. 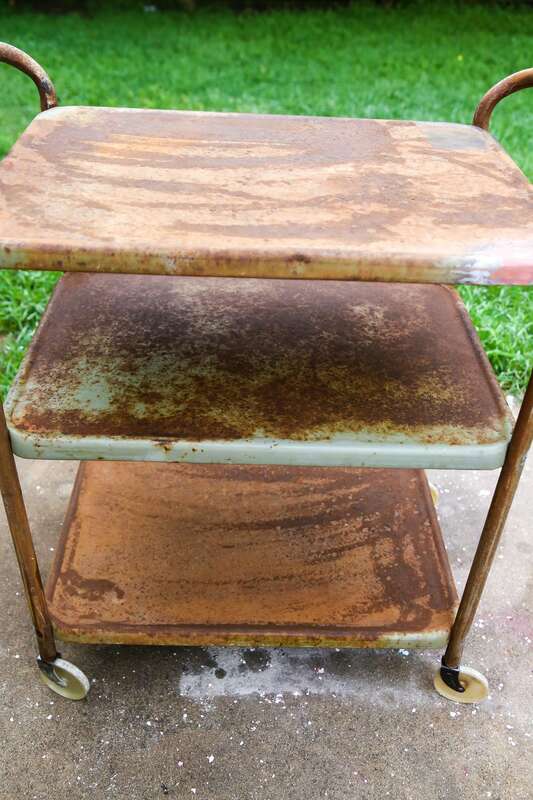 I have a bar cart that has a nice rusty patina going on. 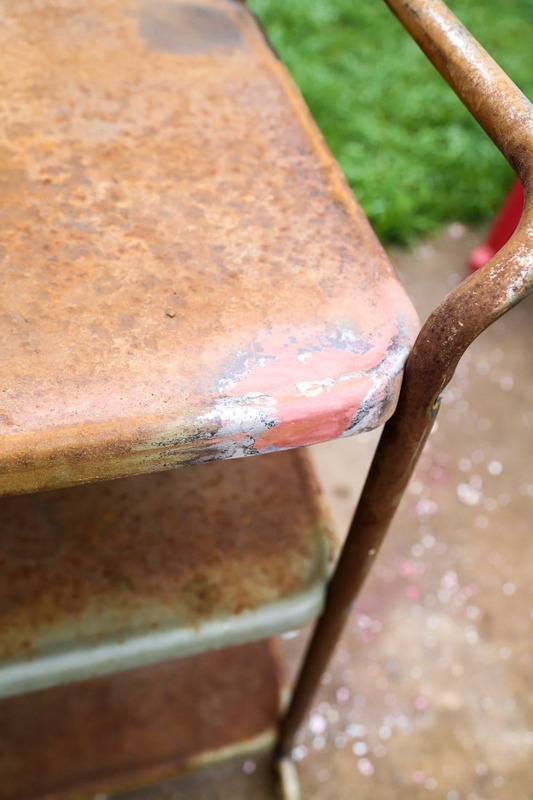 Does Rust’ Oleum have a clear coat spray that won’t change the patina/rust color that’s on my cart? I need the spray to also stop the rust progression, and make it safe to use the cart? Thanks, Lisa! They do have a clear coat that I’ve had good experience with. Here’s a link on Amazon – they have a gloss version too, but I assume you’d prefer matte for a rusty piece. 🙂 That should work well for you! This is absolutely gorgeous and the color is perfect! I would’ve definitely been a bit nervous to take this on but, it’s awesome that you did. What would we do without Rustoleum? No idea 😀 Pinned! Thanks, Angie! Rustoleum is definitely the best! Great success! I have a similar piece that could use some help. Two questions, if you may? Did you take the legs apart from the shelves to get at rust that might be in those joints? And did you prime the undersides of the shelves? Thanks much. I had NO idea something so rusty had a chance at a life other than “rusty” yard (or basement!) art. I didn’t take the legs apart – I probably could have, but I just left that alone. And yes, I did prime and paint the underside of the shelves as well. i am in the process of making the same thing. where can i buy new cute wheels for my cart? my old cart is mini so like a kids size. any ideas where i can oder some? also can i get the paint anywhere? Hi, Sandra! I believe they sell some at Lowe’s/Home Depot, and they have some great options on Amazon! They should sell the paint just about anywhere, including on Amazon – here’s the primer, and here’s the paint! We’ve used this spray paint to fix up our little 16 ft boat and 2 old cars…its so durable!!! It’s the only spray paint I’ll use! The cart looks great! I have an idea for the lady who loves yellow. How about painting a giant sunflower on the fence behind the cart? You know, a large brown center and yellow petals. Great job, Amanda!!!! I love using spray paint too, so much faster than hand painting. I didn’t know that the heavy duty Rustoleum Primer existed. I will look for it next time I shop. It’s perfect for jobs like this! And yes, this primer is the BEST! 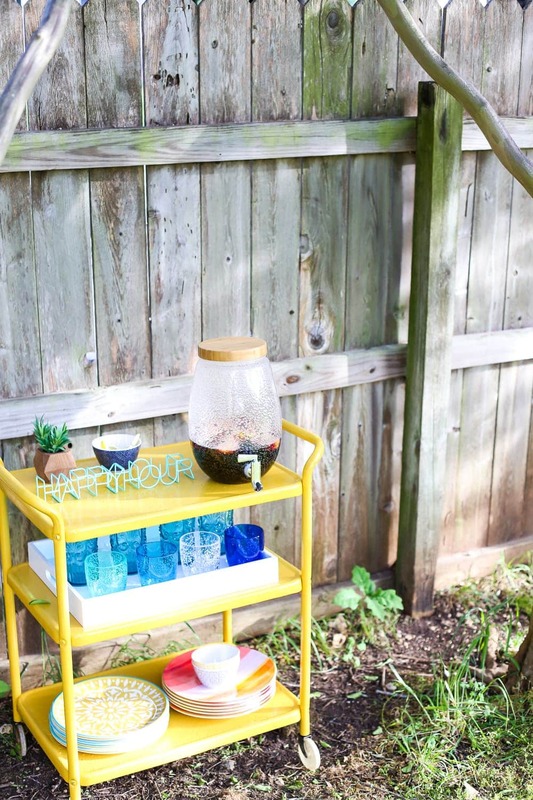 I think you did a fine job repurposing the cart, but that fence………yike! needs some tlc. It looks fabulous, love the Yellow! 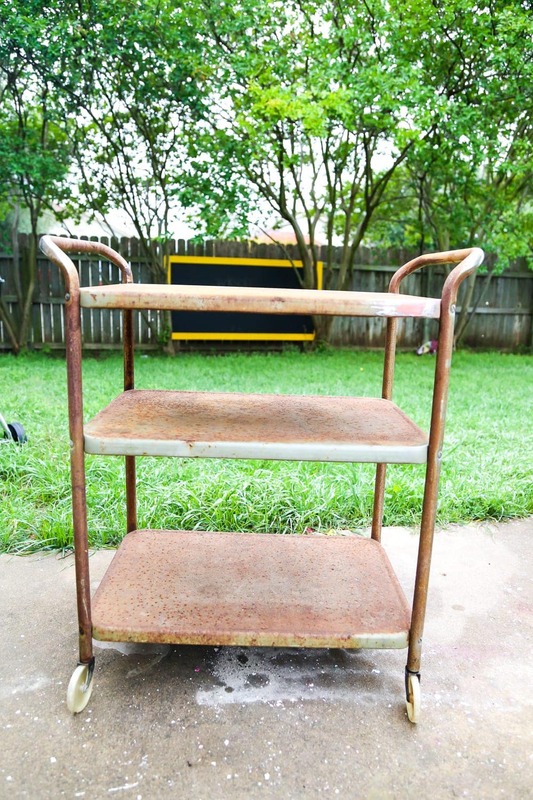 Please show how your father fixed the hole in the rusty metal bar cart. 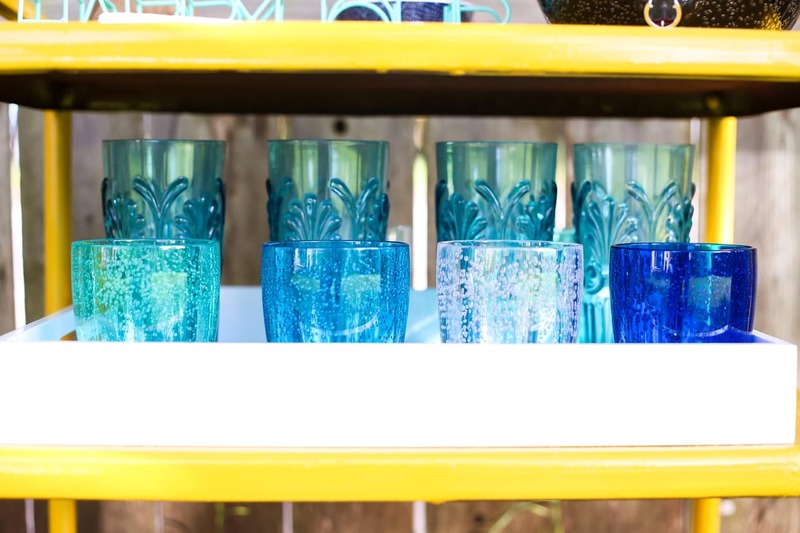 My parents had a bar cart like this when I was growing up. 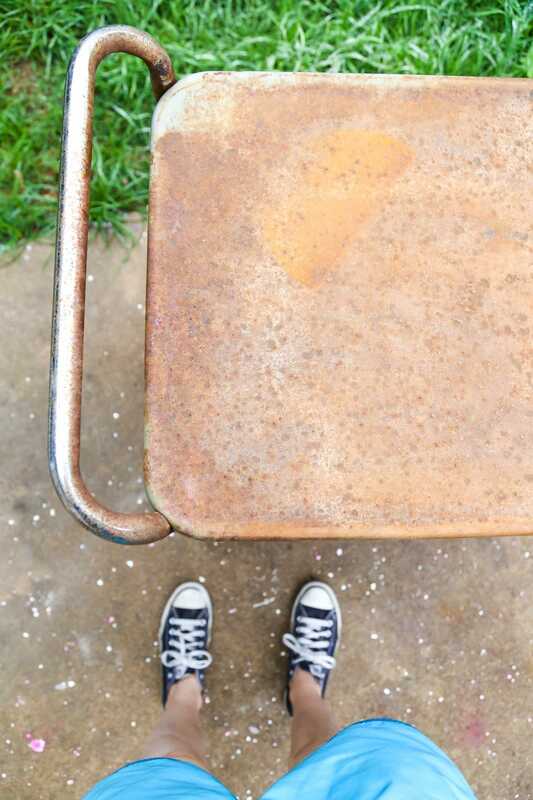 It wasn’t as rusty as yours and they both loved the old, rustic look of things so they never refinished it. My mother used it to store some of her house plants on because she had so many. In my teenage years, our front room looked like a green house! Thanks for sharing! Your cart came out beautiful! I love that idea, too! Thanks, Kate! 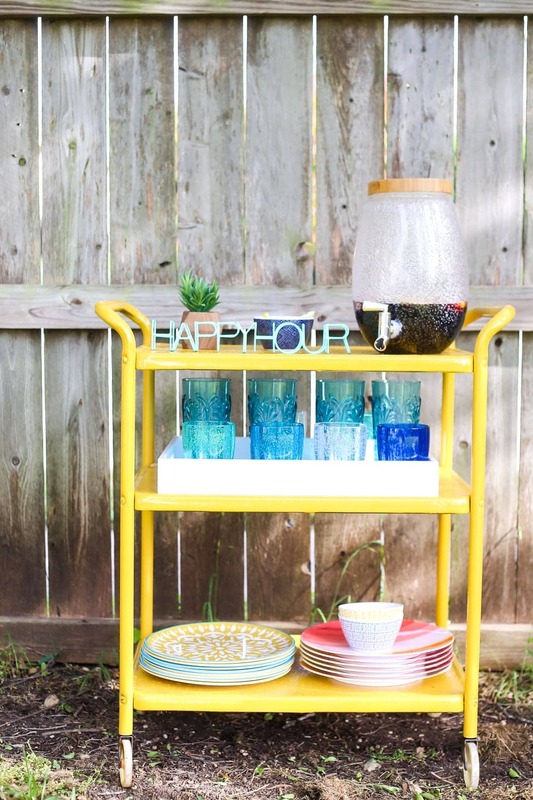 I picked up an old cart at the thrift store last summer to use as a drink station on our patio. But it wasn’t very attractive, and so I decided to get rid of it. However, it takes us awhile to get things done, and it’s still sitting in the garage. Now you’ve inspired me! Thank you for sharing! What cute transformation. It looks brand new! 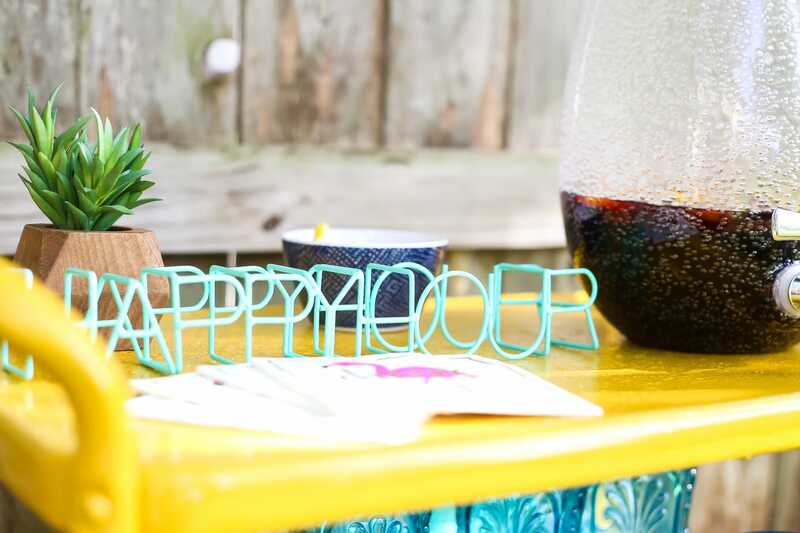 I love that happy hour sign too! Sharing on Twitter! Thank you for sharing on Merry Monday! Have a great week! Wow – you really transformed this piece. I can’t believe how rusty it was to start with and how amazing it looks now!! Wow I love the cart. The yellow is a beautiful color and so summery. Rust-Oleum paint is the only spray paint I use. 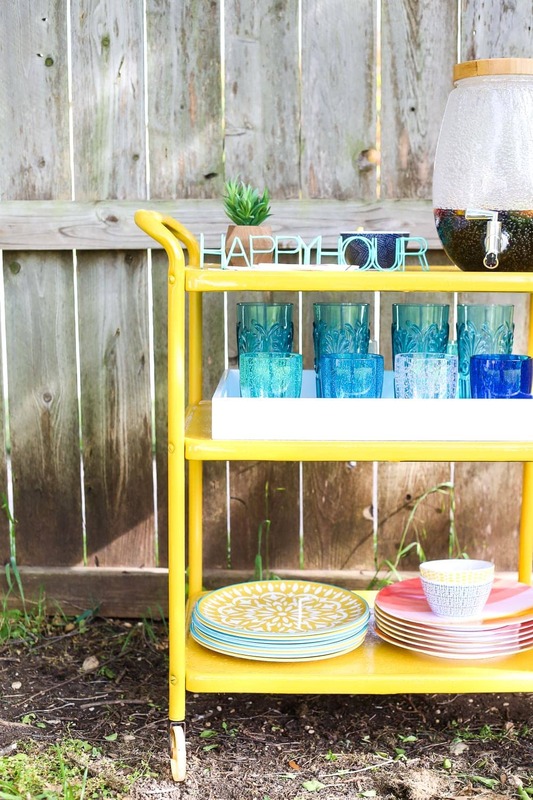 Thanks for sharing how you transformed this cart. Love this post thank you for the inspiration. Pinned. 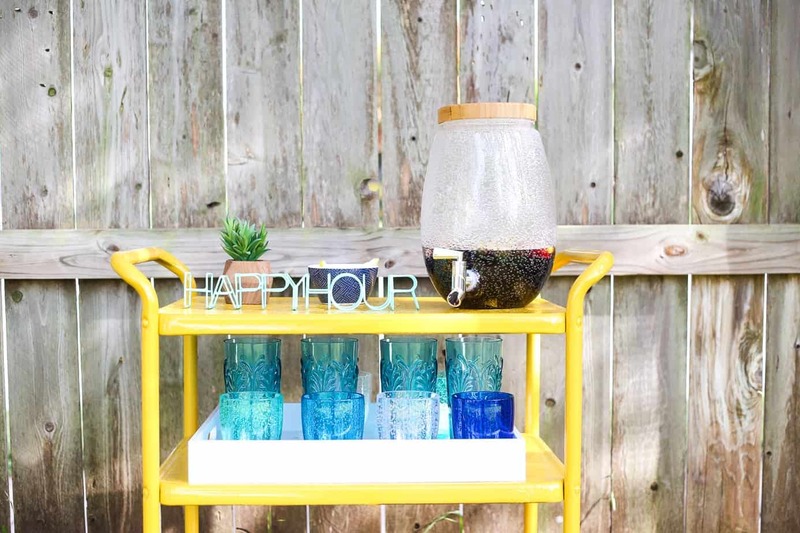 I absolutely love your bar cart! I love the yellow so much. And Rustoleum is my favorite spray paint. I use it way to much, but I’ve never tried that rust covering primer stuff. I’ll add that to my list! Beautiful job. Ooh I love this!! If I was closer, I’d be on my way over for happy hour! Awesome! I actually didn’t know this was a thing. I’m a DIYer..why didn’t I know. Maybe because I just pass over anything rusty so I didn’t have to clean it? That’s an amazing transformation! I love it! You are going to get a lot of use out of that this summer. Whoa, this turned out great! How inspiring! I’m going to go check out the contest now :). Pinning for later! Wow! What an amazing transformation, I don’t know if even I would’ve saw the potential in that piece before! 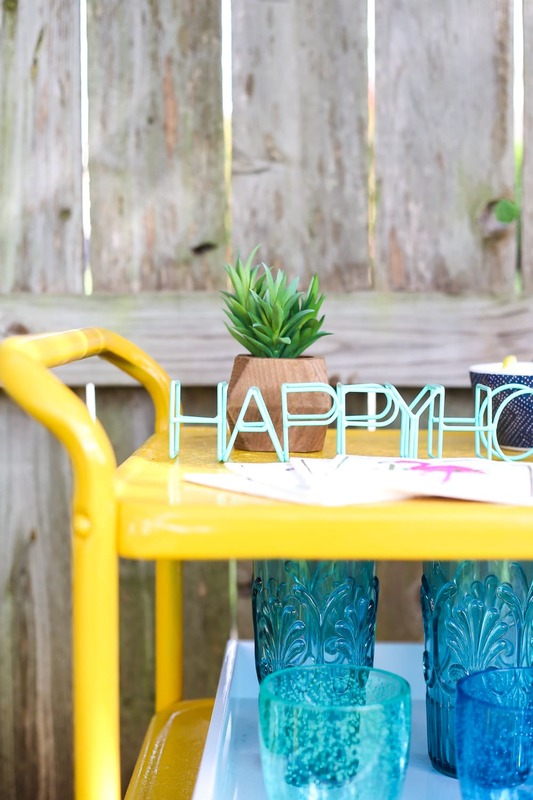 Ok, where the heck did you get that adorable little happy hour sign? It’s from the Dollar Spot at Target! $3! !